Satisfy your inner culture vulture at Sarkanniemi Theme Park and Laukko Manor. Step out of the city life by going to Hatanpaa Arboretum and Ahtari Zoo. 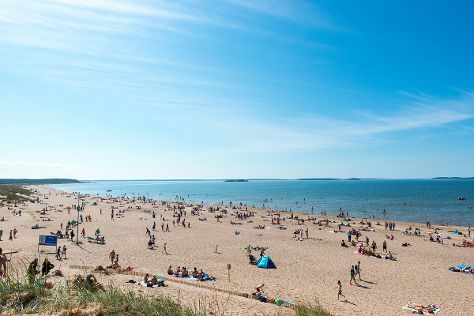 You'll find plenty of places to visit near Tampere: Villageshop Veljekset Keskinen (in Tuuri), Yyteri Beach (in Pori) and Lahti (Sibelius Hall & Motorcycle Museum of Finland). Spend the 23rd (Thu) exploring nature at Seitsemisen Kansallispuisto. There's much more to do: contemplate in the serene atmosphere at Tampere Cathedral, test your team's savvy at popular escape rooms, pause for some serene contemplation at Finlayson Church, and take in the exciting artwork at Galleria Ronga. To see traveler tips, where to stay, reviews, and other tourist information, use the Tampere trip planner . If you are flying in from Israel, the closest major airport is Tampere-Pirkkala Airport. Expect a daytime high around 17°C in May, and nighttime lows around 4°C. Wrap up your sightseeing on the 24th (Fri) early enough to travel back home.